And yet the sham drags on for a couple of hours, accusing and amplifying everything in sight, to shoehorn its identity as a thriller, says Sukanya Verma. 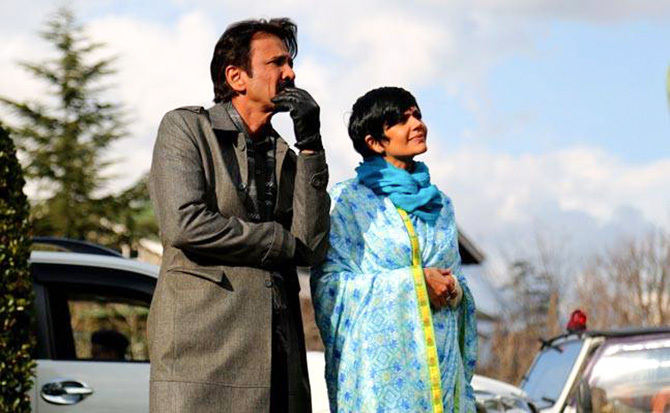 Ever so often, Kay Kay Menon keeps dozing off between solving cases to dream up an open-air bed and breakfast scenario in snow-clad Manali. It's like being inside a drowsy, holiday-starved, person's head. Or perhaps an aftereffect of starring in the drab Vodka Diaries, which positions itself as a whodunit, but is too dreary to allow any fun. Whatever it is, there's no joy in seeing Kay Kay Menon's talents frittered away in tripe like Kushal Srivastava's feature length debut. There's about a five minute short worthy content in its people-die-and-disappear premise that wears its suspense on its sleeve. And yet the sham drags on for a couple of hours, accusing and amplifying everything in sight, to shoehorn its identity as a thriller. A bulk of Vodka Diaries involves a husband and wife tete-a-tete over crime and poetry in a pretty hotel room. The words coming out of their mouth are as clunky as a book of cheesy quotes; their chemistry is more frigid than the blizzard they are surrounded in. Kay Kay as the headstrong cop and Mandira Bedi as his poetess wife are agreeable folk but cannot mask the general stiffness of their reel marriage. When the focus shifts from these prolonged shows of non-existent intimacy, it stops to investigate bogus crime scenes and amuse in Phullu hero Sharib Hashmi's 'Sir, laash man sleeping' brand of limp humour. Vodka Diaries is more of that unintentionally funny type where the unusually calm expressions of a random crowd gathered around a corpse buried in snow catch your eye with their conspicuous 'shooting dekhne aaya' candour. In this strangely cut film, actual crime and events preceding it happen side by side wherein a bunch of mannequins toy and trifle around each other at a nightclub called Vodka Diaries. Their sole purpose is to provide this slog its body count. Despite its love for rampant red herrings and a swelling background score, Vodka Diaries is unable to generate an ambiance of unease and danger that can make even the most banal B-movies worth their price in corn. In the beginning, when Kay Kay discovers a copy of L Ron Hubbard's book on Scientology in one victim's apartment, I hoped the clue would lead to something trippy. But the pay off is as shoddy as the process. Imagine Shutter Island's big twist taken completely out of context to reiterate Bollywood's hurt on the same spot again solution. What emerges is as plausible as a pig head in a frog's body.